I was eager to visit the mother ship. Ever since my first glimpse of Laysan Albatross decades before, I yearned to witness them in their wildest element, to see them by the millions in their ancestral homeland of Midway Atoll. 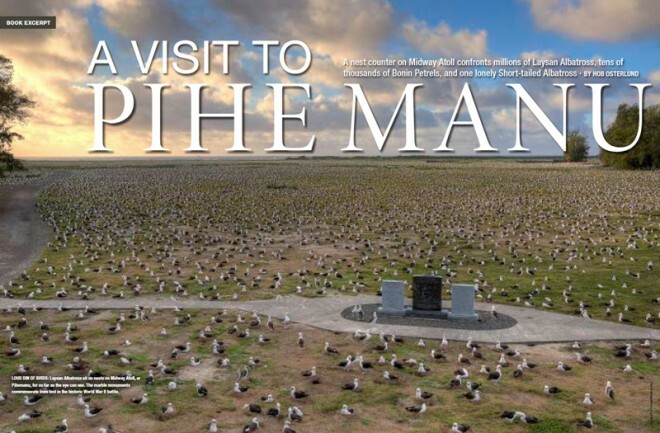 The opportunity to visit Pihemanu — as it’s known in Hawaiian — does not come around often. The refuge has been slimmed by several federal budget cuts; when the atoll was last open to research and ecotourism in 2012, only 330 people were given permits in the entire year. The following year even fewer were granted access. In the fall of 2013, my first chance — perhaps my only chance — appeared. Invitations were sent to wait-listed candidates from Beth Flint of the US Fish and Wildlife Service. Our job would be to tally albatross nests. Beth kindly encouraged us to consider the physical and psychological rigors of the job before committing. We would work full-time for about three weeks, with days off only on Christmas and New Year’s. We would be walking all day every day, except for when we were biking to our sectors or crawling under dense shrubs. When the wind kicked up, we would be retreating to open spaces to avoid getting smacked by falling limbs. 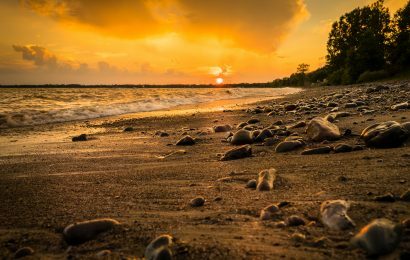 We should be prepared for blazing sun, sudden squalls, and daytime temperatures that might vary as much as thirty degrees. We would be carrying paint guns. Since each of us would pull the trigger thousands of times during the count, we should bring garden gloves and duct tape to prevent finger blisters. We would bushwhack through Verbesina — a noxious weed with nasty thorns — in thickets up to seven feet tall. We would traverse mine fields of petrel burrows; falling in them would be inevitable. We would live in barracks, sharing our rooms with commuting cockroaches and centipedes. Rust-colored water could rush from our faucets. Internet access would be intermittent and cell phone reception absent. We would be fed three meals a day, all with spicy Asian options, because half of the resident staff at Midway is from Thailand. We should buy flight insurance, or — if we’d rather take a pass — be prepared to personally pay thirty thousand dollars for an airlift should we require urgent medical attention. The Friends of Midway Association would help subsidize us; our out-of-pocket costs would be about two thousand dollars each, plus round-trip airfare from home to Honolulu. My reply to the invitation, now that I had a detailed picture of the volunteer job? I went weak in the knees just thinking about it. We all had the same stalker; its name was sand. Sand that managed to be powdery and abrasive at the same time. Sand that seemed to thrive on friction. Sand that burrowed inside my socks and rubbed my skin raw, even after several washings. Sand that signed a long-term lease and took up residence in my ears. Sand that insisted on sharing my sheets. Sand that could make a saint swear like a drunken sailor. Why was I surprised? I should’ve taken a clue from the English name for this island. With all these millions of glorious flying beings, you’d think, wouldn’t you, that the biggest of three Midway Islands would be called — oh I don’t know — say, Albatross Island or Moli Atoll? But no. It’s called Sand Island. I rest my case. We were issued paint guns, divided into three teams, and assigned a specific sector to start our counting. In the first few hours, my team of six women tallied close to ten thousand nests. We wove among albatross, trying to discern which birds were sitting on eggs and which birds were sitting on laurels. We squirted a dab of paint near each nest — not so close the bird accidentally ingested it, not so far the dab looked unrelated to the nest. The goal: neither overlook nor double-count. This got trickier when the wind picked up and the paint spray migrated. We skipped an entire sector because an endangered monk seal was napping among the birds; no one was allowed within one hundred and fifty feet. 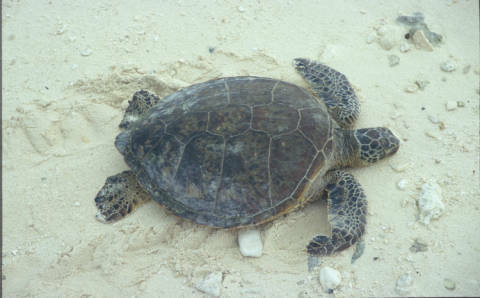 On the adjacent beach there were at least twenty honu — green sea turtles — lounging like lizards, all survivors of impossible odds. One female was so huge she looked like she could bench-press the pier, concrete pilings and all. I wished I had her stamina. 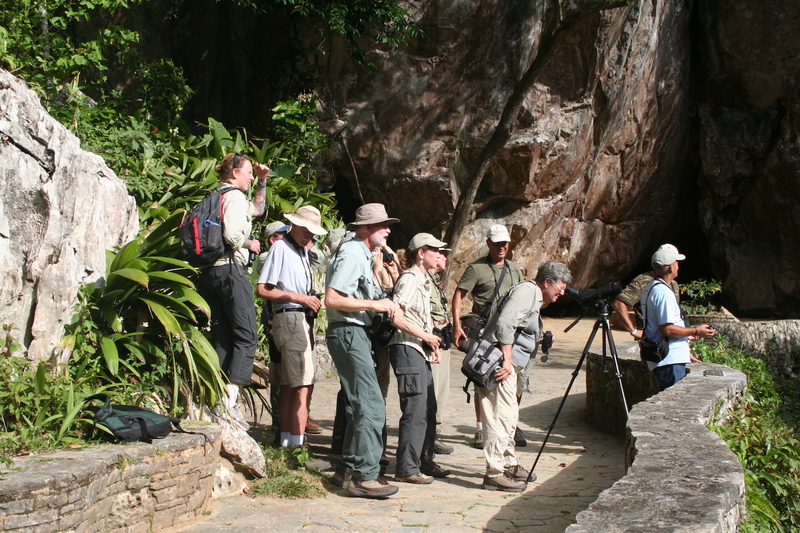 It turned out the hardest part about being on the Survey Team was not sand, physical exertion, or cranky temperaments. It was the burrows. Burrows that belonged to those Bonin Petrels, numbering in the tens of thousands. The little feathered backhoes make it a practice to dig around and under albatross nests. You often couldn’t see them until your foot suddenly collapsed a burrow and your legs went knee-deep in sand. I made rude noises every single solitary time because every single solitary time it was shocking, even when I totally knew it was going to happen. Since I never knew for sure if one of the eight-ounce excavators was at home, I followed the guidelines and started shoveling. Sand poured over the tops of my boots and through the threads of my socks. It snuck into my pants and up my shirt like a subway pervert. It didn’t take long for me to discover how much I hated falling. Every fall felt like a failure to me. I didn’t care that the surface was soft. I didn’t care that everyone was doing it. I didn’t care that it was unavoidable. But whether I loved it or hated it, it’s what I had. It’s what we all had. All day I fell into burrows, most of which — praise Pihemanu — were vacant. But not always. One afternoon when I was on my hands and knees again, digging like a dog, I discovered two birds about ten inches under the surface. They were mates, doing their family planning. Can you imagine going along all la de da, like honey let’s make us a baby, and then someone three hundred times your size steps on your spine? Naturally you would lose the mood. For one thing, you can’t breathe. Plus you’re buried alive, your home is worth a lot less on the market, and a monster is snooping around in your love chamber. That’s a lot of letting go. After I interrupted their love­making, my job was to give the petrels access to air so they could scramble out from under the avalanche. When I succeeded in saving their lives, it turned out they did not appreciate my efforts. They thanked me by nipping my fingers and telling me off with verbiage I’d rather not repeat in polite company. At dusk, hundreds of thousands of additional petrels dropped from the sky after their day at sea. For an hour the winged pinballs bounced from every imaginable trajectory and made joyful noises unto the heavens. They were darters, not unlike bats. After they landed, they sat patiently on the ground like they were expecting public transportation. When my headlamp glanced over them on my way home from dinner, several of the birds flew straight for my face. What am I, a bus? It was Christmas morning. All eighteen members of the survey team dispersed for our first day off. As I pedaled into the wind on Panama Jack, inquisitive White “Fairy” Terns hovered over my head like angels scattering sacraments. Yellow Canaries hopped from tree to tree, chirping cheerful ideas to each other. A highly endangered Laysan Teal waddled across the path, her mallard-colored body distinct from her mottled head, as if she hadn’t quite decided which outfit to wear for the holidays. Common Mynas — superb mimics, all — stood in a circle clacking and whinnying, doing their best moli impersonations. There was rumored to be a lone male Short-tailed Albatross somewhere in the avian masses. If so, he was a very rare bird indeed. Many years ago his species was clubbed to near-extinction in Japan, millions of magnificent creatures sacrificed for London ladies’ hats. When we wear feathers like crowns, are we hoping birds will abdicate to us? I rode across the runway and dismounted when I thought I was in the vicinity of the short-tailed wonder. As I peered through my binoculars, a low-flying albatross slammed into the back of my head. I fell to my knees from the sheer force of the moli momentum. There was no pain, no blood, no blackout. There was this strange sloshing, though, as if my brain had liquefied on impact. 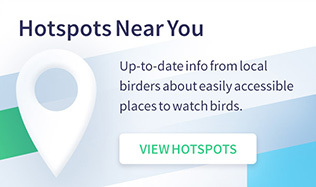 I turned to look behind me, rubbing my scalp, half-expecting to see a knocked-out bird with cartoon stars circling his cranium. But I was in the middle of a mob, and there was no clue which bird had miscalculated my density. He must have jumped up after our wham-bam and hurried away without so much as a thank you ma’am. I must admit I was a little disappointed our intimate moment mattered to me and me alone. Then from my sandy seat in the grass, my thoughts returned to the Short-tailed Albatross. Looking around, I spotted him about two hundred feet away. He was huge. He had a waxen yellow head, a pretty pink bill, and a body of white feathers perfectly trimmed with black. There was nothing especially short about his tail. Despite the courtship frenzy going on all around him, he looked bored. The winds of the North Pacific did not cause him to hunker down, but the prospect of a girl did. His odds were long, very long. There may not have been an eligible female within a thousand miles or more. 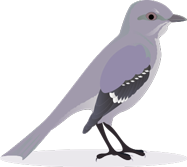 A few years ago there had been a brief flash in the pan for him, when two short-tailed girls were seen on Kure Atoll, about fifty miles away. Their eligibility status changed, however, when they decided to hook up with each other. The girls’ relationship continues to this day. Bachelorhood is a tiny obstacle compared to looming submersion. Current NASA estimates suggest a three-foot sea level rise by the end of this century. Gigantic weather had already happened. When the Japanese tsunami hit in 2011, all human inhabitants of Pihemanu retreated to the third floor of Charlie Barracks. The downy albatross babes had no such means of escape. When it was over, two hundred and fifty thousand chicks were gone. Half the entire population that year; half the class of 2011. I wanted to honor them. Commemorating other species does not trivialize human loss — it adds paint to the palette. It colors outside the dark lines of grief and makes it more honest. It was nesting season, for example, when Midway was bombed on December 7, 1941 — the same day as Pearl Harbor. Why not add the birds to our Memorial Day eulogies and commission moli sculptures among the marble monuments for lost men? I know we can’t erase human tragedies, but can’t we at least acknowledge the loss of other innocent beings caught in our crossfire? Are they not our brothers and sisters? Pihemanu translates to “loud din of birds.” In this case “din” doesn’t merely refer to noise, nor does it translate well. Its origin may be the Sanskrit word dhvan: to roar, hint at, imply, make a noise, become covered, darken, allude to, envelop, or wrap up. A Hawaiian-speaking colleague recently compared the din of Pihemanu to the collective sounds at a boisterous wedding reception. Among the Christmas expressions I heard were wolf whistles, insults, commitments, proposals, apologies, recapitulations, memorials, birth announcements, and dance invitations. I could have listened for years and still failed to comprehend all of what was being expressed. 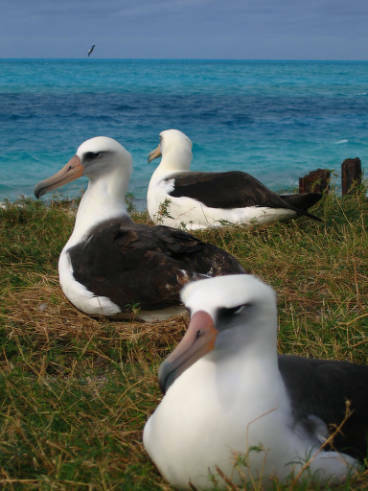 The majority of the sentiments came from Laysan Albatross, but not exclu­sively. Handsome Black-footed Albatross stroked the lower chords amidst the high-pitched, swirling, chaotic music. They chanted a nasal uh-oh, uh-oh, uh-oh and trumpeted a note that sounded like “hey” in a sustained syllable that echoed from a faraway river canyon, shouted by a man who urgently needed to be rescued. To be honest, I couldn’t be entirely certain whether some of the sounds didn’t come from the reverberations inside my own banged-up head. I didn’t know if their calls were a warning, a plea, or a mantra. I didn’t know if I was saved or screwed. I only knew I was being called. I returned to Kaua‘i from my stint at Pihemanu. 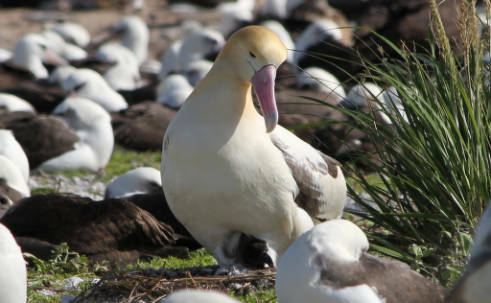 In the end, the Survey Team had counted nests representing more than a million albatross, not including at least another million untallied non-nesters. 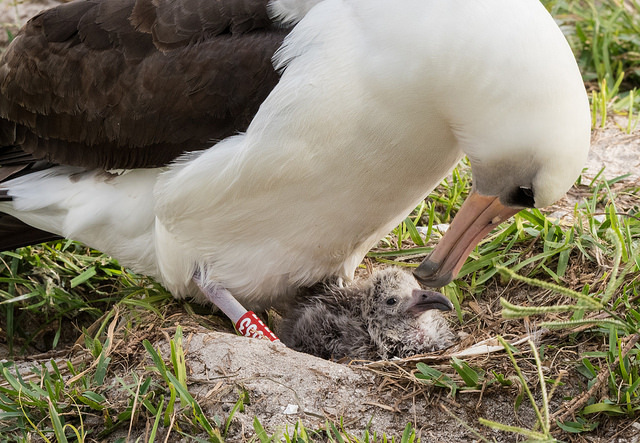 By mid-July, after months of feeding and brooding by Wisdom and her mate, Akeakamai, Kukini was no longer being sighted on the atoll, leading refuge staff to speculate that the young albatross had learned to fly and was now foraging in the recently expanded Papahanaumokuakea Marine National Monument. 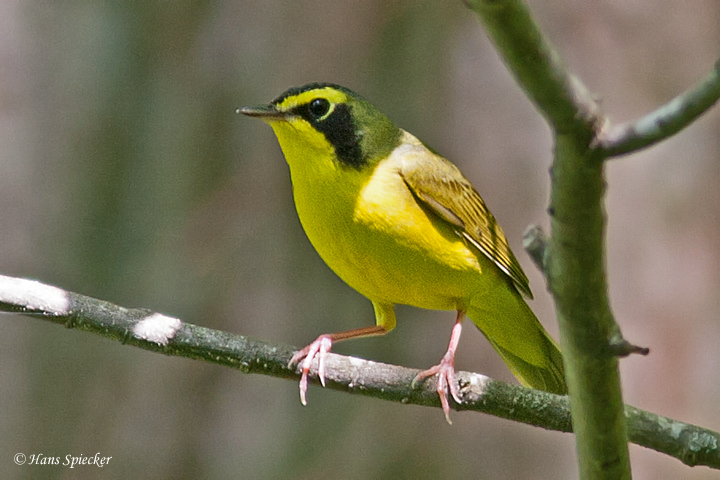 The bird is not expected to return to land until it is ready to find a mate, in three to five years. Wisdom laid an egg again in December 2016. On February 16, 2017, the U.S. Fish and Wildlife Service announced that this egg had hatched as well and Wisdom, at no fewer than 66 years old, was caring for her new chick. Hob Osterlund is an award-winning writer and photographer, the founder of the Kauai Albatross Network, and a fellow with the Safina Center. She is also the Kauai coordinator for the Cornell Lab of Ornithology’s Laysan Albatross bird cam. 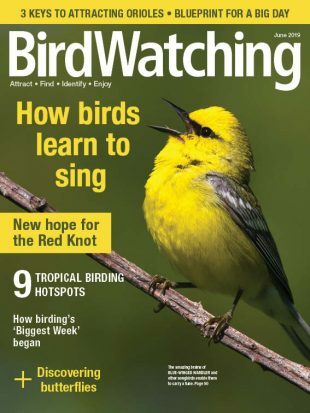 In our August 2010 issue, she described birding at Kilauea Point National Wildlife Refuge, Kauai, Hotspot Near You No. 96. This is an excerpt from the book Holy Mōlī: Albatross and Other Ancestors, by Hob Osterlund (Oregon State University Press, 2016). ©2016, published by permission of Oregon State University Press.